Everyone is encouraged to participate. A great opportunity to showcase your work and get feedback. Don't miss it!!! On the occasion of the project "GRAPHIC, NOVEL. Sketching W. G. Sebald in Pristina." 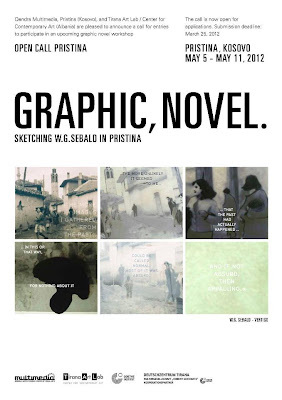 Tirana Art Lab - Center for Contemporary Art, Tirana, and Qendra Multimedia, Pristina, are pleased to announce a Call for Entries to attend the upcoming graphic novel workshop in Pristina, Kosovo, from: May 5 - May 11, 2012. The workshop is open to art students, graphic-novelists, comic artists, designers, illustrators, visuals artists and writers of all ages and backgrounds. THE SUCCESSFUL APPLICANTS WILL RECEIVE TRAVEL COSTS AND FREE BOARD AND LODGING IN PRISTINA. To application is now open!! !